When it comes to tires, we need to distinguish between two different types: a cyclist’s preference between tubular and clincher also has an influence on his choice of wheels to be used. Have you always mounted a clincher? Are you curious to try the tubular but you are concerned about changing tires? There are some solutions on the market. Discover them with us! Tubular or clincher for my bike? Tell me what tire you use, and I will tell you who you are. If tires are the first (and also the only) point of contact between your bike and the road, it goes without saying that the choice of the right product is essential to enjoy a great riding experience. But, what type of tires are available? Let’s discover it together. Tubulars are the professionals, agonists and evolved amateurs’ favorite choice due to a matter of providing a much better performance. They are tires which, as the name explains, are born as a closed tubular section. They are glued to the rim (usually in carbon fiber yet in very few cases also in aluminum) with a special glue or a two-sided adhesive. Inside them, an air chamber is sewn, protected by a webbing that can withstand higher inflation pressures (also up to 10/12 bar). They are then equipped with a rubber tread which ensures grip, low rolling resistance and, if reinforced by a double layer of material, a great protection against punctures. As said, the level of their performance makes tubulars the most suitable product for professionals’ wheels and for those who have competition in their DNA. At an amateur level these tires are oftentimes avoided as they are not comfortable to carry and replace in the event of a flat. 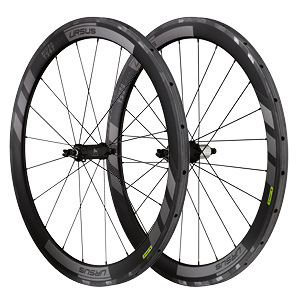 The higher price of tubulars compared to that of clinchers also affects the purchasing decision, in relation to an inferior convenience of use. Two types of tubular available today in our shop are the Miura TS37 EVO and TS47 EVO, both medium profile, also available in the disc version. Clinchers are the most classic type of tire. Originally mounted on city bikes for their practicality, today they are typically used for bicycle touring and in the amateur field. At a professional level they are still chosen for long training sessions which require a bike that is as reliable as possible (although, in the last period, when the course is particularly rough, some professionals use the clincher during a race as well). The clincher is composed by a cloth carcass, the rubber tread, and completed by an inner tube in butyl or latex (lighter and a better material for performance, but also is more delicate). They differ because, while the tubular is a “closed pipe element”, the clincher is an “open” tire in which the inner tube is mounted in the assembly phase. Beading at the end of the U-shaped tire hooks onto the rim, strengthening the external structure in contact with the wheel (usually in aluminum, but as we will see, there are also carbon clincher solutions) They can easily be removed with bare hands by the cyclist, although it will work better with the help of a tire lever. 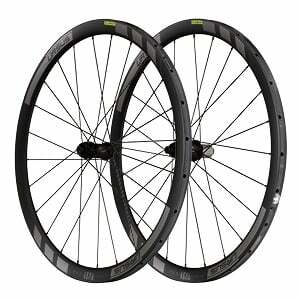 With quality being equal, the clincher is more economical than a tubeless or a tubular and it offers greater practicality if replacement is needed, something that makes it very popular amongst those who travel a large number of kilometers. You will be able to bike even with a lower inflation pressure without the risk of puncturing the tire. 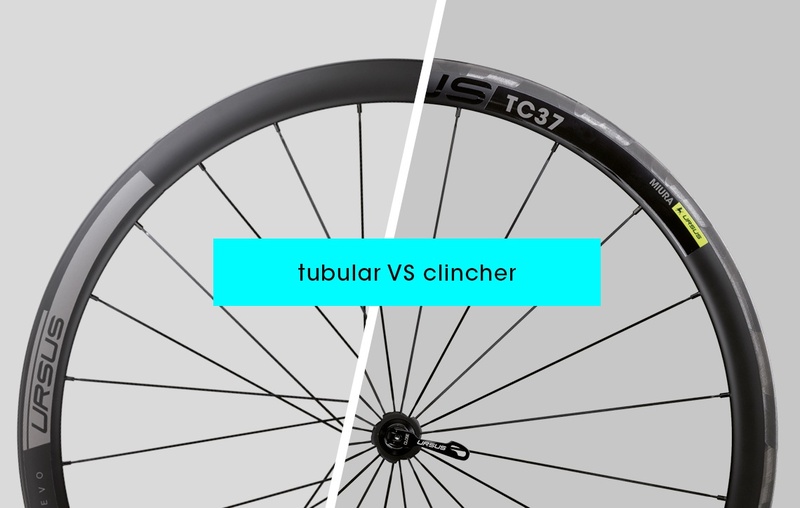 Tubular vs clincher: what kind of wheels can you find? If you want to enjoy the highest level of performance offered by the tubular, the required choice is to match a pair of full carbon wheels. Ursus, for example, proposes the models utilized by professional teams’ cyclists, such as Miura TS47 or Miura TS37. At the clincher level, the possibilities are wide-ranging. It starts from the classic and more economical solution with an aluminum rim (Athon, Blaze, Izar), up to the Miura C series carbon wheels (in the versions C37 and C50). An example of very safe wheels can be the C or the TC: the use of special carbon fiber and of the particular protective resin, makes these products extremely safe, great performance and long lasting. The same solution is adopted in all Ursus products for clinchers, like for example MiAmi: a carbon rim with an interestingly competitive price, designed to meet the needs of an amateur who loves to be competitive in any situation. 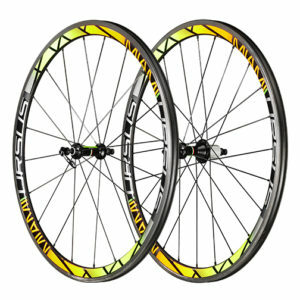 Finally, a hybrid solution is represented by the innovative carbon rims for Tubeless. With these special models, in fact, it is possible to mount on the same rim Tubeless UTS tires without an inner tube or the classical clinchers. The versatility of such a product provides the cyclist the freedom to choose on a case-by-case basis the type of tire to be used according to the course that is to be taken on. Within Ursus this wide range of these types of products is identified by Miura TC (in the models TC37 and TC67 and in their disc brake version, TC37 DISC e TC67 DISC). 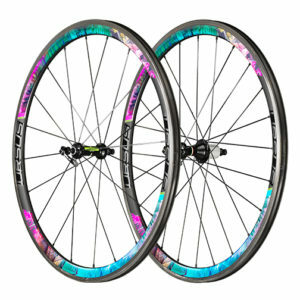 Wheels for racing bikes: tubular vs clincher, what is the best solution? There is no right or wrong choice. Reading this article, you were able to understand how, according to the needs of the individual cyclist, it is possible to direct your interest in products which are very different in terms of performance and price.